Preheat oven to 350 and spray a large casserole baking dish (or 9x13 pan) with cooking spray. If you don't already have cooked quinoa, then you'll need to prepare that according to package directions. In a large sauce pan, heat butter. Add diced onions until they just start to brown. Stir in milk, chicken stock, and slowly add 1 cup shredded cheese. Continue stirring until well-combined. To thicken, add the corn starch & water mixture. For that, dissolve corn starch in water and stir into the warm mixture. For a thicker sauce, you could double the corn starch & water mixture. In the large casserole dish, combine 2 to 3 cups of cooked quinoa with the broccoli florets. 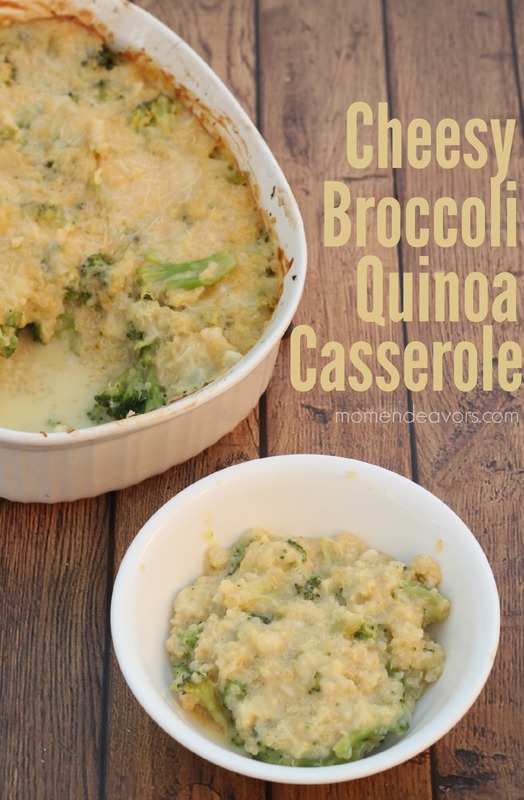 Pour the cheesy sauce over the quinoa & broccoli and stir to combine. Top the mixture with the remaining cheese and bake for 10-15 minutes (just long enough for the cheese to melt and the top to just start browning).